We hypothesize that analysts with a bullish stock recommendation have an interest in not being subsequently contradicted by negative firm-specific news. 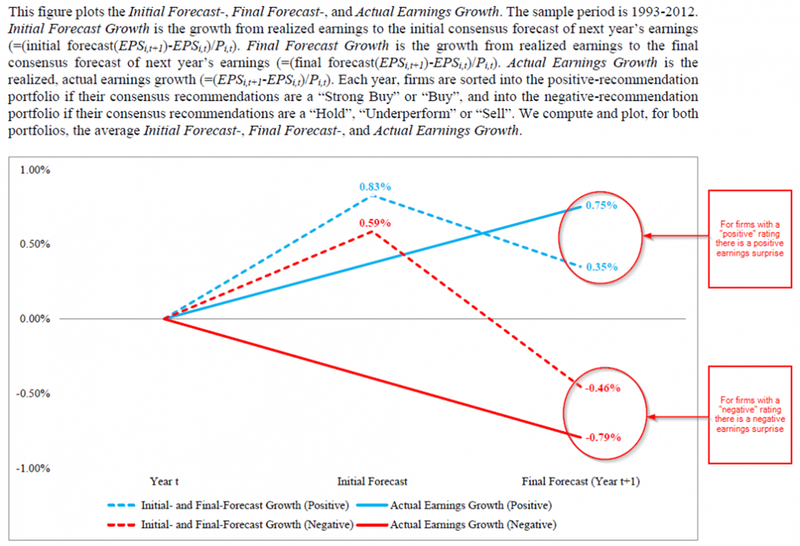 As a result, these analysts report downward-biased earnings forecasts so that the company is less likely to experience a negative earnings surprise. Analogously, analysts with a bearish recommendation report upward biased earnings forecasts so that the firm is less likely to experience a strong positive earnings surprise. Consistent with this notion, we find that stock recommendations significantly and positively predict subsequent earnings surprises, as well as narrow beats versus narrow misses. This predictability is concentrated in situations where the motivation for such behavior is particularly strong. Stock recommendations also predict earnings-announcement-day returns. A long-short portfolio that exploits this predictability earns abnormal returns of 125 basis points per month. Biased Analysts Create Big Profits? Want a summary of academic papers with alpha? Check out our free Academic Alpha Database! To better assess the economic magnitude of our finding, we employ the following calendar-time portfolio approach: We sort earnings announcements into two groups based on the consensus recommendation prior to the earnings announcement. On any given trading day, we purchase stocks that have a strong buy/buy consensus recommendation and that are announcing earnings in three trading days (i.e., we purchase stocks at time t=-3, where t=0 is the earnings announcement day or the next trading day if earnings are announced on a non-trading day; “long leg”). We short stocks that have a hold/underperform/sell consensus recommendation and that are announcing earnings in three trading days (“short leg”). Each stock is kept in the long/short-portfolio for seven trading days (i.e., until t=+3). If on any given day, there are less than or equal to 10 stocks on either the long or short side, we hold the 3-month Treasury bill instead of the long-short portfolio (this is the case for less than 5% of the trading days). 150bps x 12 months = some SERIOUS annual alpha!